Click on the above link to see where we have gone so far. Click on the above link to see where we are at present. 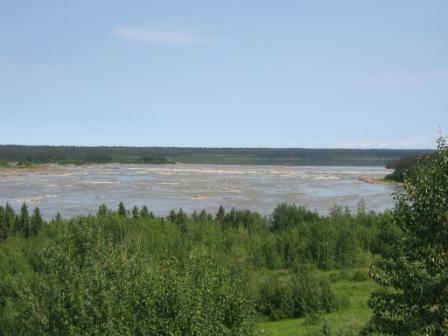 We made it out of the NWT and into Fort Nelson (and far enough south to get get a satellite internet connection at 58 degrees north latitude). Our travels in the NWT are updated below. 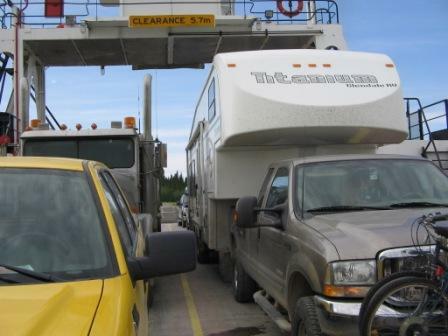 We expect to be out of internet range as the signal strength here is 36, just enough to get on-line, and we are heading north to Watson Lake in the Yukon. 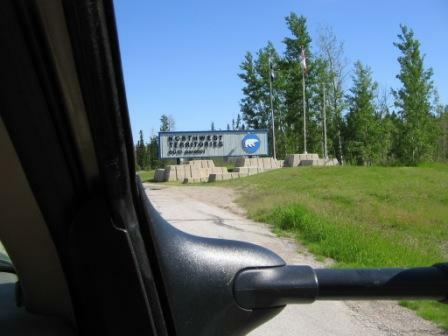 It's on the Alaska highway, and we want to see if the sign that the girls did in 1992 is still on the post. We talked to some fellow campers here, they said that it might take some time to find the sign, because of the number that are posted annually. 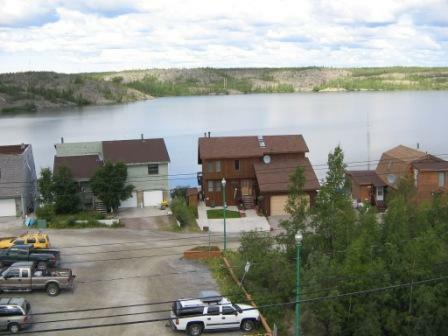 After Watson Lake, we will probably head south into BC via the Cassier highway, and we will update teh traip when we get back into satellite dish range. 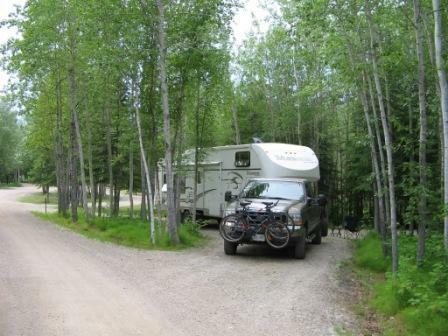 This park is the first park that people hit when coming up the Liard trail from Fort Nelson BC. In our minds, it is the highpoint (at least on our trip) for bugs, they were so bad that the park attendant places mosquito coils in the showers to reduce the blood contribution of campers! 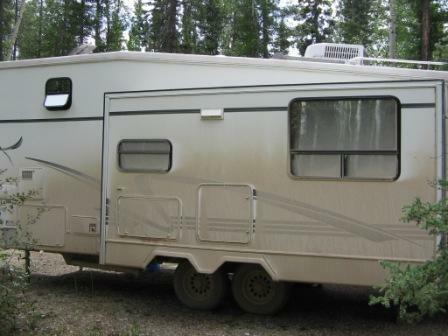 We used large quantities of DEET, and we placed a Vapona strip in the camper to knock the critters down. We also discovered Off towelettes, which work much better than the spray! 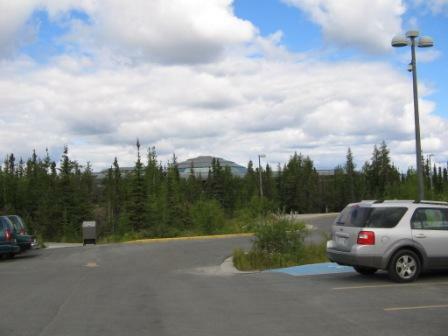 This park is located just past Enterprise on the Mackenzie Highway. 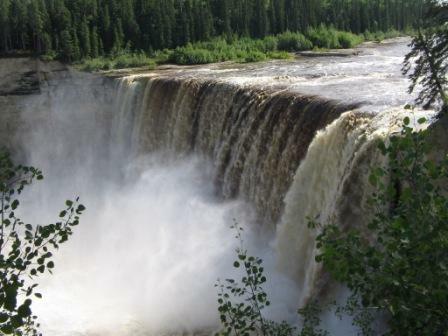 It is a good one day stop, and has a great waterfall to visit. A great trail to a waterfall, 50 ft. drop off with no guardrails or danger signs! 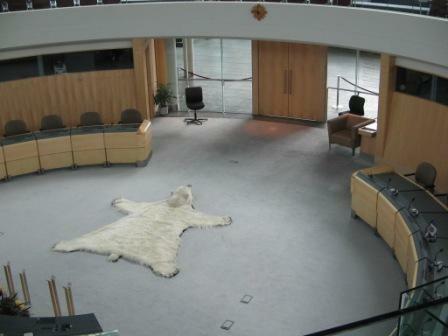 Two days were spent provisioning, exploring Yellowknife and being laid back. 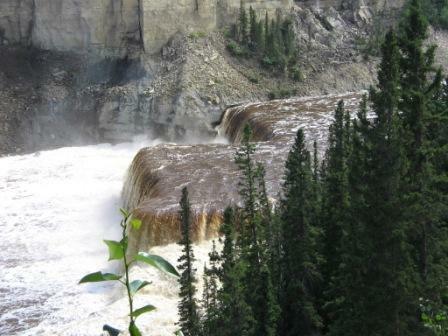 Fred Henne is the busiest park in the NWT; it has almost 100 sites and was full over the weekend. We arrived mid-morning Sunday and we knew that there were a number of empty sites (we saw a number of 5th wheelers heading south on the way up, and we had to turn around inside the park after being turned away), but the park has a couple of stupid rules: check out time is 2:00 pm and they don’t ask campers to surrender their permits upon leaving, they can renew at 1:59 pm. As a result of this stupidity, we parked in the day use area from mid-morning until 2:00 pm, and then waited until at least 2:30 pm until the site survey was done confirming that a good portion of the park was empty. Obviously, these folks don’t know how to run a busy park, a note is on it’s way to the NWT tourist folks to make a suggestion or two to improve the situation. 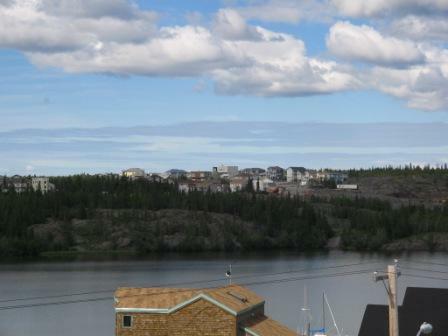 We had an opportunity to tour Yellowknife in some detail, like Hay River, it has an "old town" that was used in the early days (located on 2 islands) and the modern town located on the mainland. Just outside the airport is a Bristol plane originally used by Wardair, with the blue Wardair makings. As I recall, Max Ward started up her and retired here after the sale of Wardair to CP Air. 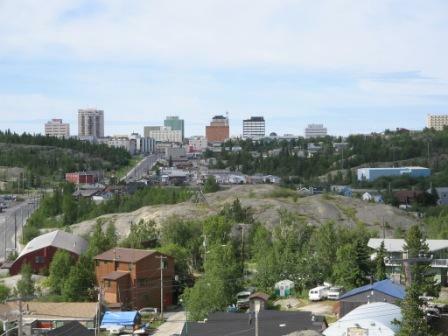 Yellowknife is somewhat like Sudbury in that it is rocky, with little opportunity for underground services. 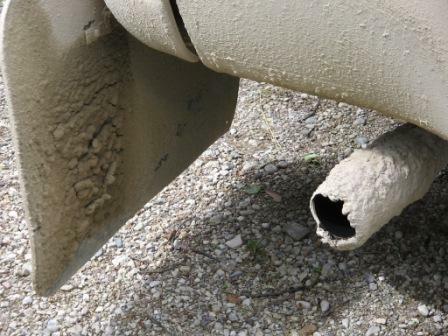 Water and sewage is in many cases trucked in and out. This was the first opportunity to do some real boondocking! The road was a bit tedious, and we decided to pull over to this day use area (the northbound sign said camping, the southbound sign did not). 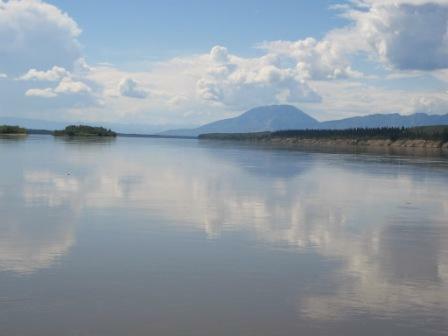 Before we hit the "campground", we crossed the Mackenzie river by ferry. In the winter, the crossing is by ice bridge, in the slush season, no crossings occur! 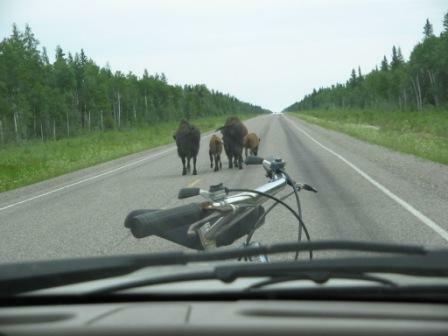 Again, these guys (and calves) have the right of the road! 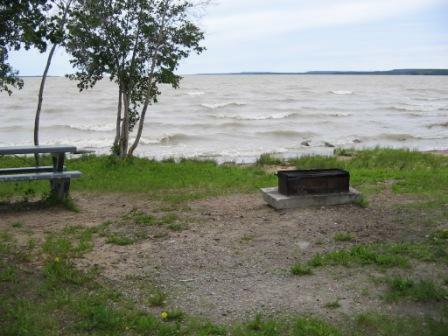 We go a great view of Great Slave Lake, although the breeze and temperature made it a little cool. 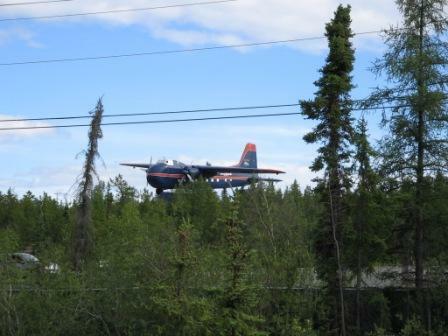 A Chinese couple from BC decided to stop and camp as well, they ultimately followed us to Yellowknife. 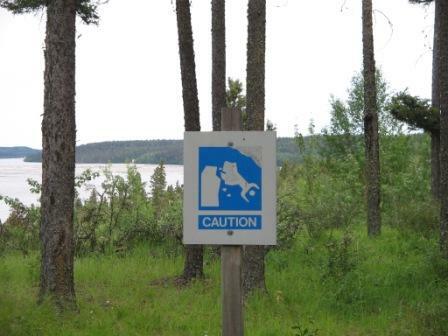 This park was a one night stop on the way to Yellowknife. There were some great falls here, the view was excellent. Wednesday & Thursday July 5-6, 2006. We made the 270 km. 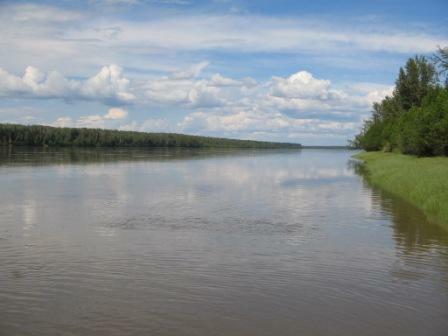 run to Fort Smith and Wood Buffalo National Park. The road was quite good, a combination of pavement and gravel. 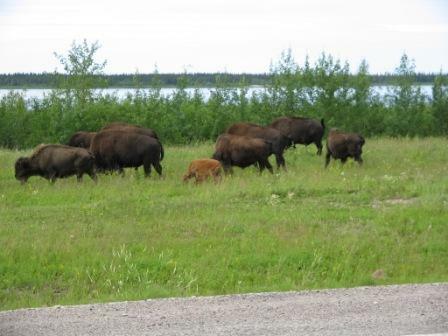 There were a number of bison on the road; you have to stop to let them clear the road, as they seem to have no fear of the vehicle. 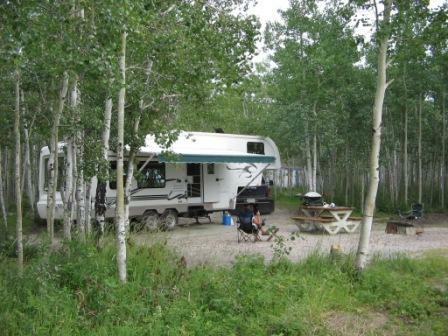 We spent 2 days here; the second day was spent in Wood Buffalo National Park, exploring the north end of the park. 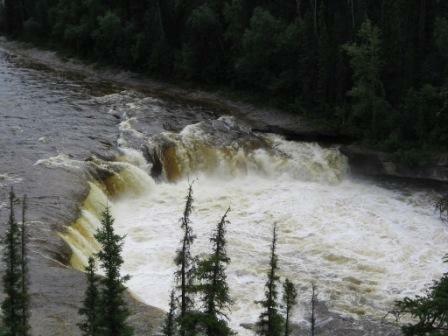 We also spent some time in town looking at the Slave River Rapids and getting the feel of Fort Smith. 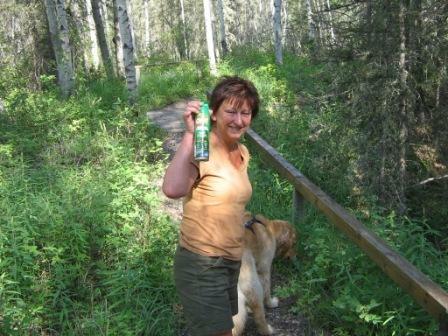 When doing the trails, DEET is a must! The NWT foks have a sensible way to warn people about drop offs and danger, they don't put up barricades, they just post signs that indicate that you are in deep trouble unless you are careful! Diesel fuel, at $1.329!! per liter, was the most expensive so far on the trip. 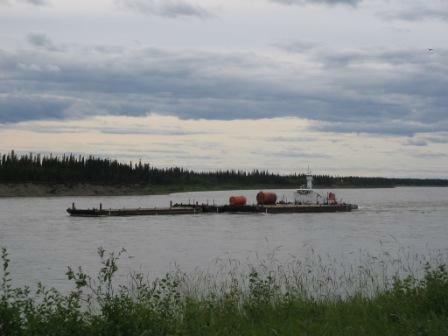 We moved up the road, reaching Hay River on the Monday of the long weekend. We stayed at the Hay River Territorial Park in the “old town” of Hay River. 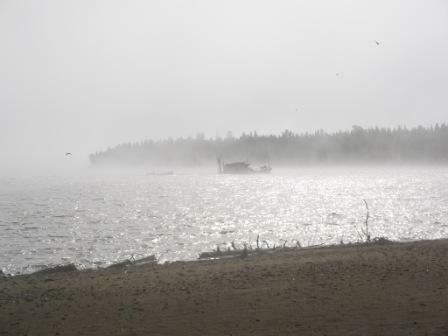 Back in the 1960’s, the old town, which is located on an island in the delta of the Hay River as the river enters Great Slave Lake, was flooded out. 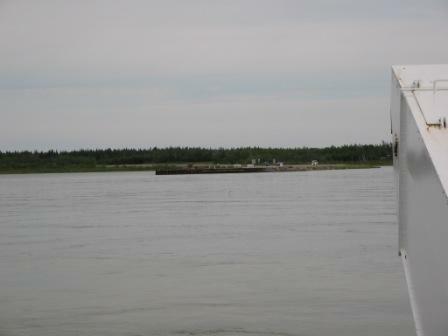 A decision was made to build a “new town” on the shore, old town remains but is left for the locals and fishermen, it is also where the drydock and docks are located for the ships and barges serving the lake, the Mackenzie river and the Beaufort sea. 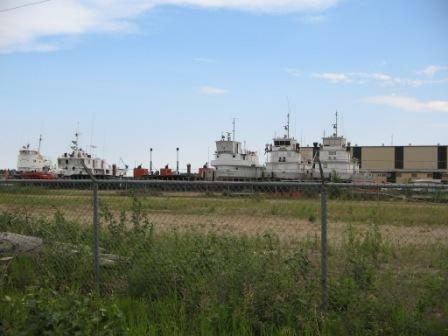 This is a picture of the drydock area, the tugs shown are actually on the scrapheap, they would be great converted to cruisers for personal use! We used the stop to provision and to have the truck serviced (almost 6,000 Km. traveled since the trip started). It was necessary to install a bug screen in front of the rad, after cleaning the rad, because of the large number of bugs that accumulated. We also purchased a satellite radio, as between towns, there is no signal, and listening to the CBC continuously becomes tiresome after a while. According to the sales folks up here, the Serius service is good up to the Beaufort Sea, so we will be able to have music wherever we go. We stopped at the border to obtain information, and were amazed at the size and quantity of the flies. They replaced the mosquitoes as the main pest, they are easier to control but they are so large they are intimidating! They surround the RV and can fly at up to 30 km. 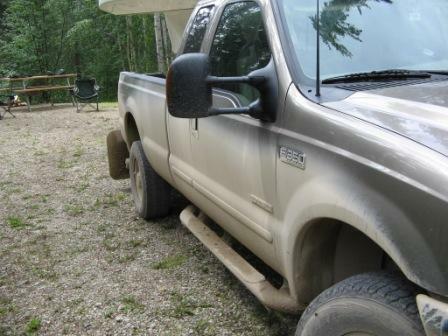 per hour when chasing the truck! When they bite, it hurts, but the DEET holds them at bay. 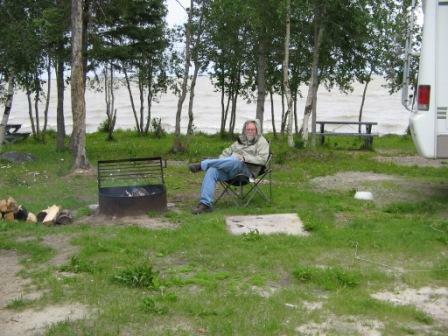 This was our first night in the NWT, the park is about 70 km. inside the territories, a nice stop. The facility was the cleanest campground that we have ever been in, the showers were so clean that we felt bad leaving some water on the floor! 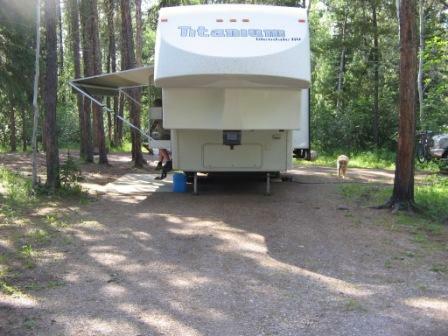 We were afraid of not getting a site on the long weekend, but as we were to find out, most of the sites were empty. 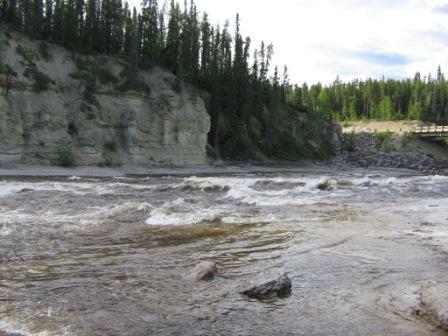 The NWT have set up the parks in a specific way, with cooking shelters and washroom/shower facilities having the same appearance, similar to the way that National Parks are set up. In Twin Falls, the task of installing infrastructure is difficult as the soil is very shallow over a great depth of rock, meaning all gray and black water from the facilities has to be stored then trucked out for disposal. It also appears that the fresh water has to be trucked in. The twin falls were spectacular and the work done to create trails and lookouts was very good.